Using what they call "illumination-aware age progression," the method requires only one initial photograph as it "automatically produces a series of age-progressed outputs between 1 and 80 years of age, accounting for pose, expression, and illumination." The results are stunning and even a little spooky. With implications for everything from missing children investigations to Hollywood effects, the technique—explored in much greater detail in this PDF—offers impressive realism from only a single photograph. 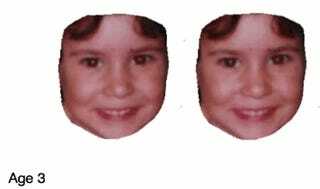 Compare the results, for example, when visual input was taken from a single childhood photograph, then morphed by the same technique to resemble photos of the actual child taken later, at specific ages. 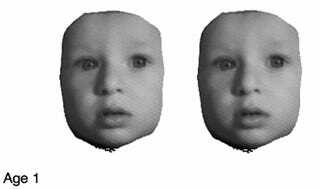 The digital technique—the left-hand photos in the above sequence show how the child's face would have been modeled by the algorithm—clearly does not exactly predict what the future face will look like. Further, as the researchers point out, the age-progressed simulated faces you see in that sequence have been "composited into the ground truth photo to match the hairstyle and background," which explains the shifting eyes and the otherwise impossible to predict changes in hairstyle. This thus also throws off any true basis of comparison. Even in the full research paper, there is some compositing in the final results (note the change in eyes in the final photo, for example), seen below. Even so, despite the compositing seen in those examples, the effects are uncanny, as the GIFs embedded in this post demonstrate. In those GIFS, you are watching a single photo, with no compositing effects, stretch, darken, and sag—oh, the wonders of aging!—through 80 years of future history. As the researchers—Ira Kemelmacher-Shlizerman, Supasorn Suwajanakorn, and Steven M. Seitz—describe it, "These averages depict a prototype man and woman aging from 0 to 80, under any desired illumination, and capture the differences in shape and texture between ages. Applying these differences to a new photo yields an age progressed result."